Congratulations to our 2018 NetTA Winners! Layer123 is delighted to announce that the Network Transformation Awards & Gala Dinner will take place in The Hague alongside SDN NFV World Congress once again in October 2018. Join us as we celebrate and honour the industry’s achievements in accelerating network transformation through collaboration and partnering. Today's telecom market is increasingly competitive and awards are a great way of headlining your leadership and differentiating your company. 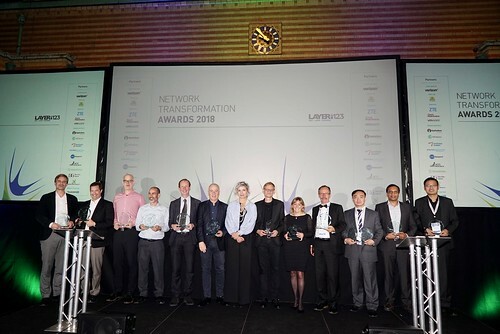 NetTAs – Network Transformation Awards – shines a spotlight on the industry’s most innovative people and companies by recognising their most successful achievements in accelerating network transformation over the last 12 months. The Network Transformation Awards RECOGNISE achievement in advancing the industry to the next generation of networks. Join us to CELEBRATE innovation and excellence in delivering the next generation of products and services founded on SDN and NFV. Winners will INSPIRE determination, progress and future collaboration between executives, leaders and activists. Submissions making the shortlist will be published and prominently featured across major media channels. Winners will be announced and trophies presented at the NetTA Gala Dinner & Awards Ceremony in October.